It sounds daft, I know, to wish a winter would go by more slowly. Most folks wish for the exact opposite, fervently hoping February and March will pick up speed and rip by like a sheet of plywood caught in a gale-force wind, bringing warm planting weather behind it. Hunkered down waiting for spring, the cold dark months usually crawl by with excruciating slowness. Not this year, not for me. This winter is the flying sheet of plywood, and I’d give anything to find the kill switch on the wind machine. Much has been done, but much remains. Since the rummage sale, I’ve made two trips to Jackson, MS to attend Grazier’s courses given by the Stockman GrassFarmer staff, stopped in Dallas for a weekend to visit my brother and his family, participated in an Appleseed rifle shoot, and made enormous progress on the condo renovation project. I’ve continued to pack, finishing several rooms and have at long last scheduled my household goods move, putting that target on the calendar, finally. The point of no return is now behind me, and as the gale continues to howl around me I’m struggling to stay focused and not fumble. Good shooters learn a lot of techniques that have a great deal of applicability to everyday life. One of them is how to make a quick, effective magazine change. Many timed courses of fire require a magazine change, and it’s a good skill to have. That rifle’s not going to do even the best shooter any good if she’s spent her bullets and can’t get a full mag back in before the charging bear is upon her. Any exigent scenario would apply, not saying I’m a bear-killer or anything. 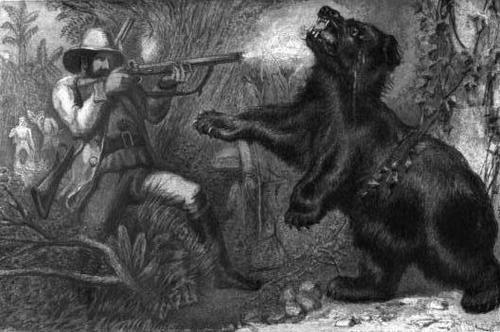 But in the heat of a moment as critical as reloading to shoot the charging bear closing in from 30 feet away, the very simple process of dropping an empty magazine, picking up a full one, inserting it into the rifle and charging the chamber for a shot, will become enormously complex, and easily gooned up with unintended fumble factor. That’s why a mag change is considered an essential element of marksmanship skill, and is part of every test. Think about it. The main reason for fumbling is hurrying. And who wouldn’t be hurrying to shove in fresh rounds to kill a charging bear? But panicked hurrying is the enemy of calm, dexterous movement, and you need dexterity to effect a rapid mag change. Slowing down, although counterintuitive when you are counting teeth in the angry bear’s mouth, will get that magazine in faster, because it eliminates the inevitable fumble factor. Hard to do in the face of danger, so we memorize the mantra, and practice, practice, practice. I am fighting the fumble factor in my life right now. Finishing my projects here in California and getting myself moved to the Farm before summer, is my mag change. Bullet on target will be me and the dogs in the little Toyota truck, pulling into the driveway of the farmhouse. The complexity of the tasks here, the enormity of work remaining to be done, is the charging bear. There are days when I look around in complete despair, thinking how impossible a task I have in front of me – so much stuff to pack, so much work to be done, and that bear is RIGHT THERE in front of me! Those thoughts don’t help, they only make me lose focus and motivation and I find myself circling around not really getting anything accomplished, and feeling sorry for myself to boot. I even start thinking I will NEVER get to the farm, that I’m going to be stuck here in suburbia forever! Of course that’s just nonsense, but it has the same effect on my ability to get things done in a day, as hurrying and fumbling to change out my rifle’s magazine. I can’t let the fear and panic I feel prevent me from getting the fresh mag in, and getting the shot off. I refuse to let that happen. So I will say, and learn, and practice: slow is smooth, smooth is fast. And I will shoot that charging bear before she gets to me.